Forget about flying cars – what about a television that senses when you have walked into the room and starts playing your favorite show? Or a washing machine that knows a red sock from a white sock? In the future, a higher degree of personalization that specifically matches your tastes, increased artificial intelligence that can think faster than you, and incredibly fast processing will be the norm. To find out what tech will be like in 2025, we tapped product designers and futurists to see what they predict will eventually replace the iPhone — or at least compete with the new iPhone 11 model. The Microsoft Kinect is an early peek at how entertainment will work in the future, says Rick Chin, the director of innovation at the product design software company SolidWorks (www.solidworks.com). In 2025, your television will not just sense that you have walked into the room, it will use multiple sensors that identify everyone in the room using facial recognition and body-shape tracking sensors, then immediately start playing the shows you recorded or that you normally like to watch. 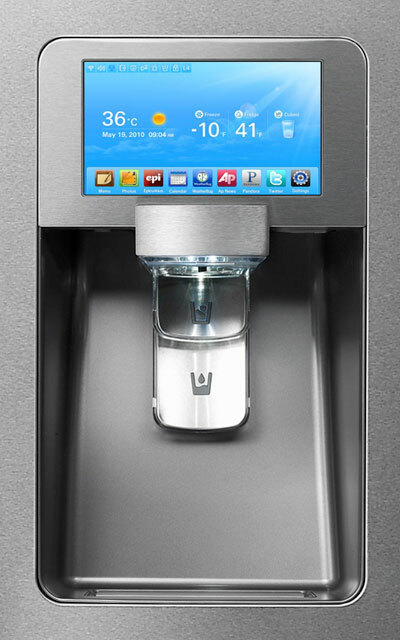 Smart appliances like the Samsung RF4289 Smart Refrigerator let you jot down notes to family members and run apps on an LCD screen. But appliances in 2025 will be even smarter, says Urlich Eberl, a senior director at Siemens AG (www.siemens.com). He says your washing machine will know what you have loaded, set the time and detergent automatically, and even let you know if you have a red sock mixed in with the whites. Of course, they will also run only during times of the day when energy is cheapest. Vehicles like the 2011 Chevy Corvette Grand Sport show a heads-up display (HUD) that emanates off the front of the car to show current speed and even the song playing on the stereo. Yet, MicroVision (www.microvision.com) has announced it is working with “a major automaker” to create a next-gen HUD using PicoHUD technology. The idea is that a color screen would emanate on the dash or in the windshield, showing much more detail: a weather forecast, navigation, or even a movie. Tiny sensors will be embedded into everything around us, says Mike Ueland, a vice president and GM at Telit (www.telit.com), a company that makes the M2M sensors. This will include everything from picture frames to dog collars, pill bottle caps to the car in your garage, and even your own body. Parking meters will send data over wireless connection directly to the city. Ueland says there are already early signs of this: A sensor in a car that feeds data about how you drive to the insurance company. Yet, by 2025, he predicts that just about everything will have an embedded sensor. Google has recently completed tests with a fleet of Toyota Prius cars that drive around Northern California on their own as a driver monitors the AI routines. Volkswagen announced a “temporary auto pilot” technology that works like adaptive cruise control in sensing the road, other cars, and lane markings. You’ll engage the setting and can catch up on your e-mail while the car does the driving. Yet, by 2025, autonomous driving on some roads will be routine, says Chin. Long-range sensors will improve to the point where they work like the radars in high-tech planes. Eberl also predicts that organic LED lights (OLED) will become more ubiquitous. 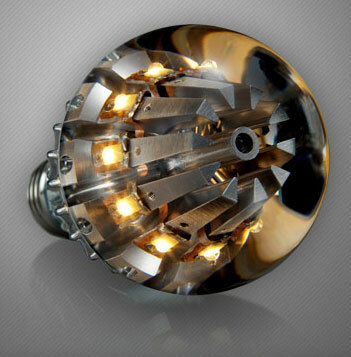 Today, LED lights like the Switch (www.switchlightbulbs.com) are just as bright as an incandescent bulb, but can last for a decade. In 2025, new OLED lights will mimic sunlight – many home builders will install them into the ceiling as track lighting. They will last just as long as LED lights, but shine with a more natural glow. High-def videoconferencing is one thing, but Intel is developing new technology for telemedicine where, by 2025, you may not have to go the doctor for a diagnosis. Instead, the doctor will chat with you on a video call and ask questions, check a wound, or even prescribe medicine based on symptoms he or she observes. Interestingly, telemedicine will have several side benefits: lower costs, better accuracy in diagnosis (because doctors will follow a set of procedures developed specifically for the remote sessions), or more frequent check-ins. A few smartphones like the Google Nexus use near-field communication to conduct transactions, but only if the retailer is set up to accept those payments. By 2025, phones will become the only way to pay for services and products, says Ueland. Call them “super smartphones” in that they will not only pay for all transactions – airline fees, food, and even your utility bill – but these more advanced devices will finally replace every other gadget you might carry: say, a digital camera or even your laptop.